Music for Firdays; "Maahi Ve"
How could I have ignored Bollywood up to this point? Huge dance productions, catchy beats, romantic leads chastely flirting. Who cares if I don't understand a word of it, this hyper energy always has me smiling. And yes I know of the Bollywood viral YouTube video with "false friends" subtitles (words that sound similar in different languages). I curse a lot when I'm sailboat racing. Since I've raced mostly by myself over the last 30 years, my cursing is quiet, inaudible to someone outside the boat, mostly under my breath. The cursing can be explosive and continuous. I curse my stupidity, or curse the fates that put me on the wrong side of the wind. I occasionally curse my poor boat for being so slow, or the stupid weather boat that has me locked into a slow death from a leeward competitor. I curse the slow roll downwind that continues into a capsize, or the radical windshift that sends me into the drink. I curse the bad starts or the starts I'm over early. And so on.....the mistakes are endless, the expletives keep rolling out. I never curse a fellow competitor, or on the rare occasions I sail a double hander, I never curse the crew; to them I'm exceedingly polite, (well maybe not to the competitor who fouls me with a smile or, worse yet, an air of indifference, but I never curse a competitor even then). Cursing stays onboard; loud enough for me to hear and no one else. This is why the following YouTube had me laughing. Your f$%&@ng using up all my heartbeats! As a young buck, thrashing around on some very high powered dinghies, I didn't give much mind to traditional boats. Pretty, yes, but why would someone bash around on those slow pokes when one can scream from one capsize to the next. With age has come some softening. Some of this is my love of history, and some is my love of variety; there is just so much beige plastic decks and white production hulls that one can absorb before the brain screams; ENOUGH! Today I'm much more apt to run over to a skipper of a Luders 16 than I am in chasing down the crew of an Australian 18. This doesn't mean I would run out to buy either one of those boats; but perhaps in my dotage I've begun to appreciate the beauty of traditional yachts and the people who build and sail them. Which brings me to the St. Michaels Mid Atlantic Small Craft Festival. I added to the end of this post that Bob Blomquist and I have gone to the Mid Atlantic Small Craft Festival the past two years, but unfortunately, I couldn't make it this year. Bob is a boat builder with many different home built craft under his belt. 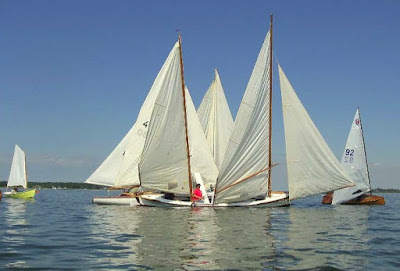 He has built probably the fastest Bolger Light schooner which he has brought to the Festival in previous years. (Click on pictures to get higher resolution). But this year he decided to bring a restored Penguin. 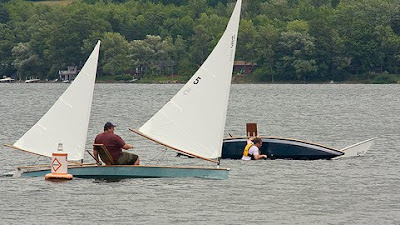 They have a sailing race at the Festival, a one lapper and there are usually over 60 sailing craft at the start line. It's a zoo but a fun zoo. Well this year Bob and his 11 1/2 foot Penguin Won!!!..... beat all those larger traditional boats in about ten knots. Bob in his restored lime green Penguin. 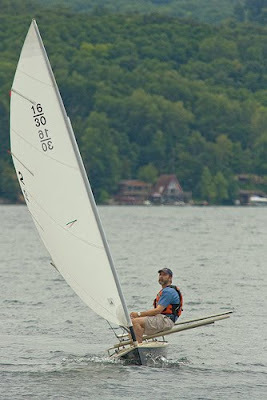 Bob won on the upwind legs and though most of the festival participants aren't racing sailors, by most rights he shouldn't have beaten the larger craft with more sail area. And that is the Achilles heel of traditional craft. With their barn door rudders and shallow centerboards, they just don't go upwind as well as the more modern sailing craft. And there are plenty of dinghies that are faster than the pokey Penguin. 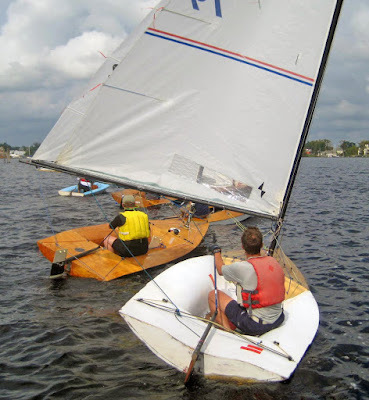 Here is a picture of the 2008 MASCF sailing race where a Classic Moth (all varnished I may add), all 11' to the far right in this picture, a small racing dinghy also vanquished the entire fleet in the MASCF sailing race. I'm planning to attend MASCF this year. These festivals really do capture the joy of boating. Melancholy song this week, incongruously attached to a travelogue. Song for a Blue Guitar from be_sides on Vimeo. I'm being lazy. Don't think I can write more than a couple of sentences so let's go to YouTube. I'll even relent to feature keelers. Excellent video by the Quantum team on the shoreside action from the 2009 TP52 Med circuit, the Portiamo regatta. Music for Friday; Band of Skulls, "Honest"
I liked the music so much in this sailing video that I emailed the videographer for the bands name. The band is "Band of Skulls" and here is their acoustic version of another of their songs "Honest". Very nice! There is an amusing thread over at the Sailing Anarchy forums, about an English bloke who ventures forth on a canal in the 10' 6" Mirror dink to get to a waterside pub just up the way. It reminds us that the Brits and others sail, and even race, on some very small waters that, in the States, nobody would consider suitable for sailing. My post on the Brigham Scows, another river class is over here. Well, before Christmas, we got 22 inches of snow, then rain washed most of it away and this past week we got 2 inches more. I see the Midwest and England have been laboring under major snowstorms. It is, after all, winter in the Northern Hemisphere; snow is part of it. As adults, we cope, we shovel, we can't wait to get our cars back on the road. For the kids, it's another universe. I know of several sailboat classes that have been reborn after going bust, but I know of only one where the class is being revived despite most of the existing boats (built pre WWII) being safely ensconced in museums. 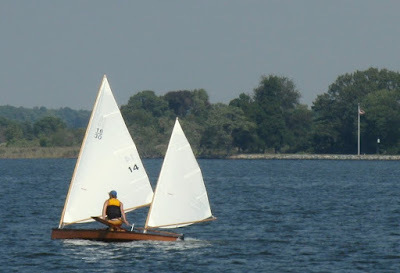 John Summers has developed a stitch and glue plywood 16X30 sailing canoe; the 16X30 being the premier American racing sailing canoe that existed up till 1933 when Brits Uffa Fox and Roger DeQuincey thoroughly trounced the Americans on their home waters and the resultant new class rules produced the modern International Canoe class (the International Canoe just recently revised their rules again). John has taken the lines of a hard chine Gilbert sailing canoe (circa early 1900's) and offers detailed set of plans through Antique Boat Museum . John writes the interesting history of bringing the 16X30 sailing canoe back to modern times over at the online "Canoe Sailing Magazine". 16X30's are being built and John sent me some photos of activity from 2009. 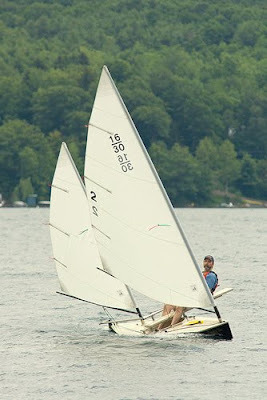 I had a chance to sail the round bilged Tomahawk 16X30 a couple of years ago. An interesting ride but I'll leave that to another post. 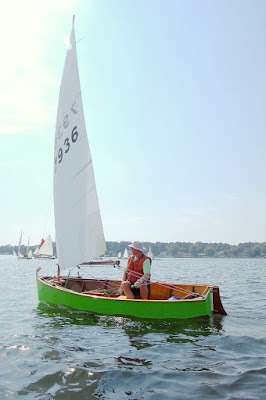 A YouTube video on 16X30's sailing and pictures of the original and prototype Gilbert canoe. Two excellent videos featuring traditional sailboats in faraway places. 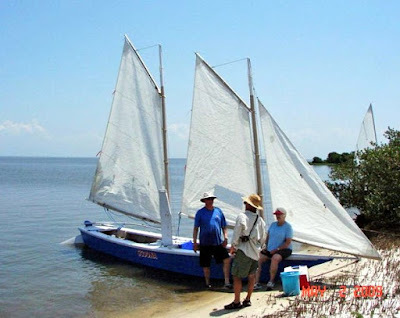 "Boat trip with a traditional sailing boat (Dhau) to "Ilha do Ibo" in northern Mozambique, and then further on through dense mangrove forests to Querimba Island. Beautiful images with music of a very remote place in Africa. Tropical dream on an Island with ruins of colonial Portuguese houses that are unchanged since the late 19. century. "The Tour de Martinique of “Yoles rondes” (curved-bottomed craft) thus called as opposed to flat-bottomed boats. It is a week-long regatta of traditional racing sailing boats run around the island of Martinique in seven stages. The Tour des Yoles Rondes of Martinique is probably the most popular event on the island as it is followed by the whole population and by an increasing number of visitors and journalists from abroad. I like the log hiking out aids, and the big, colorful, square spritsails. Steering these craft obviously takes some muscle and the boats look none too stable. My guess is these craft were adapted from European rowing gigs.